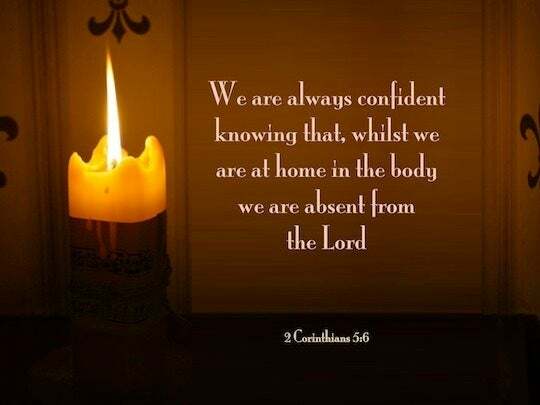 Therefore, we are always confident, and we know that as long as we are at home in this body we are away from the Lord. So then, we are always full of good and hopeful and confident courage; we know that while we are at home in the body, we are abroad from the home with the Lord [that is promised us]. Therefore, we are always of good cheer, and know well that as long as we are at home in the body we are absent from God. Being always confident therefore, and knowing that while we are present in the body we are absent from the Lord,? ?7 we walk by faith, not by sight;? 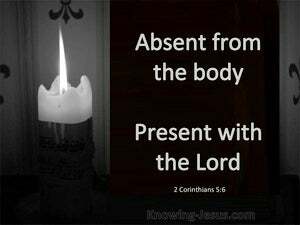 ?8 but we are confident, and are pleased rather to be absent from the body and to be present with the Lord. Therefore we are always confident, knowing that, while our home is in the body, we are absent from our home with the Lord.